The many faces of satire. Satire is a difficult topic to study, yet also a popular one. This article intends to give an overview of the various aspects that the genre of satire entails. Discussed are satire’s parasitic nature, its tendency to rely on existing media and art forms for its mode of expression; the relation between satire and play; and the intended and unintended provocations to which satire can lead. 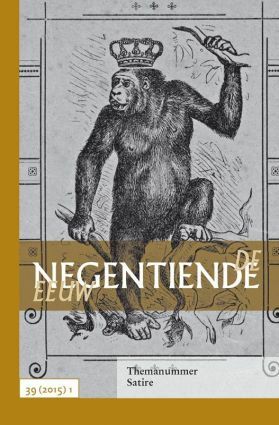 These aspects of the satiric genre are illustrated through some cases of nineteenth-century Dutch satire, supplemented with examples from other periods and regions, including our own time. It is argued that, in the end, a topic as multifarious as satire is best served by a broad, inclusive and open research perspective. Oh, my little martyr! J.B.D. Wibmer’s postures and the possibilities for political criticism around 1820. In this article, the oeuvre of J.B.D. Wibmer (1792-1836) is analyzed. This hack writer published several popular magazines and pamphlets between 1818 and 1836, in which sharply satirical opinions were expressed about the protestant church and the Dutch monarchy of William I. A posture analysis of the way Wibmer plays with (fictional) author figures, pseudonymity, anonymity and sentimental style features, shows what possibilities were available for political criticism in the harsh publishing climate around 1820. However, Wibmer’s complex satirical texts cannot unproblematically function as sources for historical research, this article argues. Dutch political satire in nineteenth century journalism. The last decades of the nineteenth century signified an important transitional period in the Netherlands in the formation of defined political movements. These movements aimed at the formation of national political parties and strove for a stronger connection to their (potential) electoral support. The printing press played a crucial role in these communications. Surprisingly, a striking component of the Dutch political journals has remained a neglected source in the existing historical narratives of these politically and socially influential decades: the satirical periodicals. Criticizing both their political friends and foes, they confronted the limits of public expression and defined political decorum in the public sphere. This article aims to encourage future research on this subject, focusing on the liberal satirical journals Asmodée (1854-1911) and Uilenspiegel (1870-1916) and their coverage of the conflict between liberal and confessional political parties concerning financial support for confessional education.